Twenty quid for a bit of plastic to strap to your bike? They saw you coming didn’t they mate? You could just make one out of a milk bottle couldn’t you? 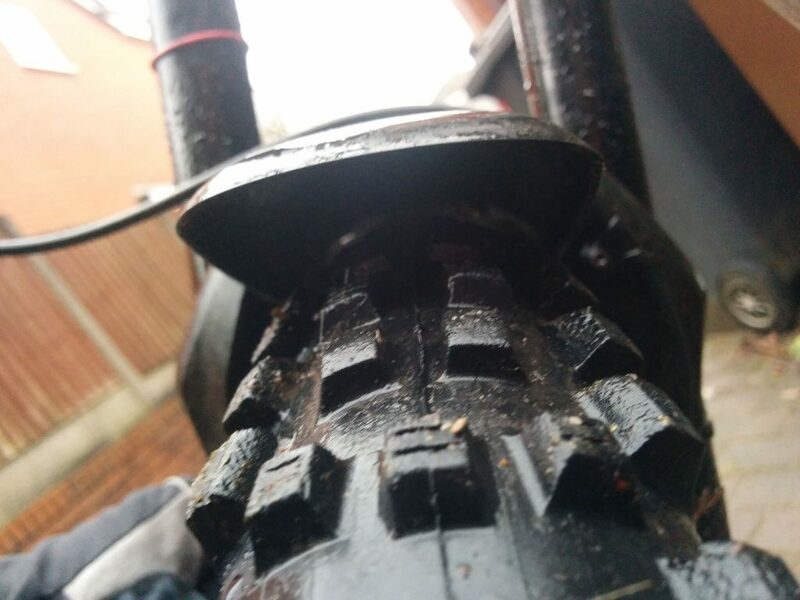 It’s fair to say that mudguards for mountain bikes have been a bit of a hard sell in the past, despite the UK always being wet and muddy for much of the year. Personally I never bothered with a Crud Catcher and then only lasted a couple of rides with more of those big rear spoiler-style guards – preferring to use an RRP Neoguard and wear glasses (and latterly waterproof shorts). But while the Neoguard was impressive initially just because it was stopping some of the spray getting on my face, it wasn’t really doing that great a job. I had a brief dalliance with a Crud FastFender which worked quite well, but lost the fixings and found it got knocked upwards a bit too easily. Next I moved on to a MuckyNutz under-arch fender, then a longer RRP EnduroGuard – these cut out a bit more spray, but still weren’t perfect. Having heard good things about chunky fenders the Mudguardz and Mudhugger offerings, I decided to try the Mudguardz PG450, priced at £23.50 and made from plastic rather than carbon fibre like their original (more expensive) products. It fixes to the crown of my 2016 non-boost Lyrik with four zipties, with a shaped section in the plastic helping make it feel surprisingly secure. It’s made from a nice thick plastic too, so should be able to take a few knocks. As you can see from the pictures clearance with a 2.35in Magic Mary is not fag-paper tight and you can see a reasonable amount of daylight (more than the picture shows, to be fair). 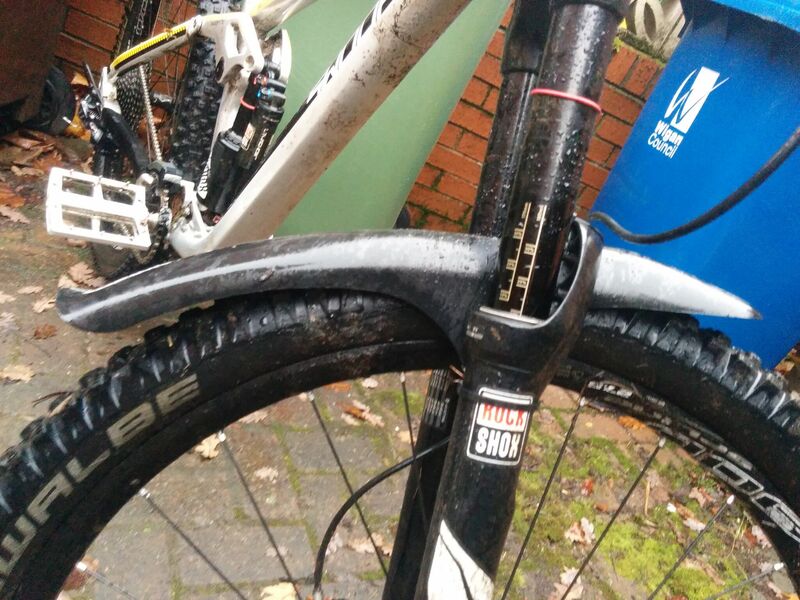 If you favour a slimmer tyre like a Shorty or something more XC, you’ll be laughing. The first ride on it was literally eye opening, as in I could ride with my eyes open and no glasses on despite the ground being wet and muddy. The combination of the close-fit and long coverage stops so much more crap getting sprayed up than anything I’ve ridden before, I was able to do a six-hour ride in super-sloppy conditions with no eyewear. Something I never thought I’d be able to say, as I get quite distracted by dirt and spray in my face. Riding with the PG450 is a similar feeling to when I first got full mudguards on a road bike and was amazed how much difference they made, allowing me to ride on soaking wet roads but come home dry. There hasn’t even been a hint of clogging yet, but I’m lucky to not have too much clag locally. If I was still local to Epping Forest then it might be a different story. 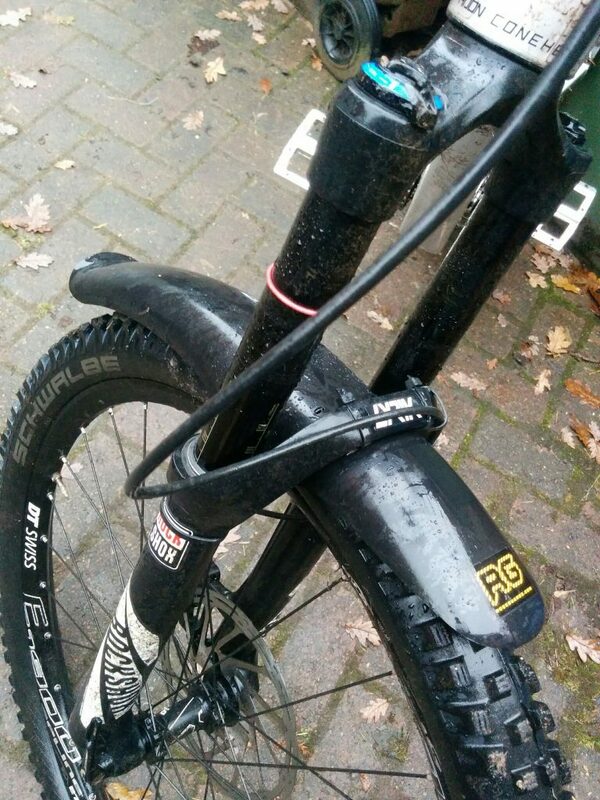 So is it worth £23.50 to be only have to worry about the mud under your wheels, rather than in your eyes and mouth? Put it like that and it seems almost cheap.